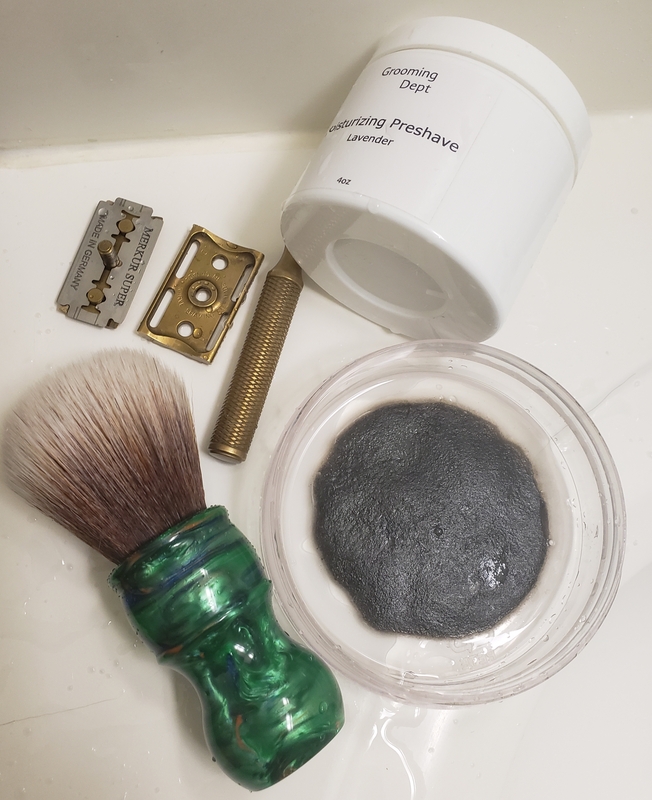 My first go with Merkur blade, was back in 2015, when, like most newbies, I got a sampler pack. I don't think I finished a single shave with it back then, threw them away, marking them as "too dull for my tough coarse beard". I revisited them in late 2016/early 2017, still found them not so good, kinda tuggy. The shave was not enjoyable at all. Last night, while going through my blade storage, I found one solitary Merkur blade, wrapped in wax paper, with close to 0 hope of being used. In the last two years, I have had this recurring thought that lots of product I used earlier in my shaving days and marked as not appropriate for my "tough coarse beard, ultra-sensitive skin" were actually pretty good. I simply didn't have a good technique back then, I emphasized less on beard prep and mapping. So I always wanted to revisit some of those. Now, after 4 years of shaving, keeping notes, talking to people, being engaged in a hobby - my technique is still improving (at least I believe so), but it has reached a point where I can truly appreciate a product for what it is - my personal imperfections can't hinder a product's working, at least not as much as it used to. That led to today's shave. My skin is going through a rough patch - suffering from worse than ordinary dryness. So I decided to add some GD preshave to my routine (this is an excellent product, but that is a topic for a separate discussion). I showered in the morning, so it was just a regular washing of face followed by pre-shave. Black Fern is a wonderful scent, I will most probably get a full tub. But the performance of the soap, while adequate, is not really that great. It is average in most areas, except for ease of lathering - it is very easy to lather. Karve(D plate) is a fine razor, but not one of my favourites. I like it, but I don't love it. I guess what I am saying is that I didn't really create an easy battlefield for Merkur to win me over. (skipped shower, average (for me) soap, razor). So, how was the shave? I didn't go full crazy and test post-shave burn using an alum block or alcohol-based aftershave as my skin is extra dry these days. But, the shave was flawless. Super comfortable, no tugging, no pulling, no friction. Just good smooth effortless shave. I guess I would consider these blades to be a bit milder than what I regularly use (Wizamet Iridium Super). But I bet in a good razor (and of course good hand ) it is sharp enough for a well prepared tough/coarse bread (I should mention that I had a 1-day growth, I should probably try multiple day growth later this week). I must say that I am shocked. Now, am I going to buy 100s of these? No. Because I have a lifetime supply of DE blades already. Plus I still think my other blades are better suited for a consistently closer shave. But I would absolutely understand if someone says they are in love with this blade. (And I will probably doubt any overly harsh opinion of these blades, but YMMV I know YMMV, but still). I think these blades are a bit sharper than Derby, on a completely hypothetical scale of 1 to 10 (10 would be a Feather or a Personna 74), I would say these are 4. Maybe 3.5. GD Lavender Pre-shave, AP Shaveco Brush, LASSCO Black Fern, Karve(D), Merkur Blade, Chatillon Lux TSM Fougere Salve. Everything purchased with my own money. Great report Sourav. You almost convince me to try Murkur again. Hey, I'll resist but perhaps if a lone blade rolls through I'll give it a go but they'll get no money from me.